The Pro Extractor Blades Assembly is compatible with Tritan Nutri Ninja cups, Stainless Steel Nutri Ninja Cups, and the XL 48 oz. Multi-Serve Nutri Ninja Jar. 1) Count the FINS IT SHOULD BE 7-FINS. 3) 4 Inch (10cm) Diameter. 1. The rubber gasket in bottom blade maybe loosened during transportation. Before using the bottom blade, please check the rubber gasket and be sure it is put snugly into the bottom blade. 2. This bottom blade applies to many models, before purchasing, please check your machine, 1) If it is 7 FINS. 2) The blander has FEMALE fins and the Blase is the MALE fins. 3)The diameter is 4 inches. NEVER BLEND WARM/HOT LIQUIDS IN THE NUTRIBULLET CUPS AS THIS MAY DAMAGE THE PIECES. ALWAYS BLEND COLD OR ROOM TEMPERATURE INGREDIENTS. 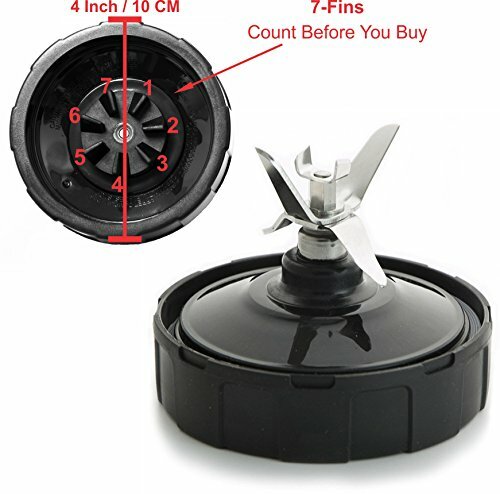 ⚠ BEFORE PURCHASING please check your existing blade for the following 1) Count the FINS IT SHOULD BE 7-FINS. 2) The blade has MALE FINS 3) 4" (10cm) Diameter. NurtiGear Premium Nutri Ninja Replacement Parts - Pro Extractor Replacement Blade by Best Accessories. Made of Food Grade BPA Free Plastic and Stainless Steel, Effortlessly Pulverizes Fruits, Vegetables, Superfoods and Protein Shakes into a Delicious, Smooth Texture. Dishwasher Safe. If you have any questions about this product by NutriGear, contact us by completing and submitting the form below. If you are looking for a specif part number, please include it with your message.